The Portuguese tend to have very long engagements, often more than a year. The wedding day is day of eating a dancing. The only church that is authorized to perform marriages is the Catholic churches. A marriage performed in a temple is not recognized. Consequently, all LDS couples are first married civily. Then if the couple wish to be married in the temple, they must travel to a temple to be sealed. They have just a few days to accomplish the sealing or they have to wait another year. Often, whether the couple is sealed in the temple or not a will have quasi ceremony at the local chapel, followed by dinner and dancing. 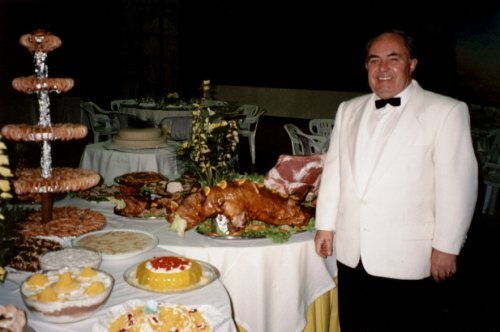 The first counselor in the mission president, Francisco Saraiva, and his wife, Aurora, catered one of the weddings of local members. The following pictures will give you some idea of the wonderful meals that were prepared. Click on the pictures to see an enlargement. This is the crew that prepared the food. Food preparation often started the day before. The night of the reception and party, this crew would perform the final preparations and get everything ready. Here the workers are preparing a tray of appetizers. Bolinhos de Bacalhau were always present and any Portuguese event. 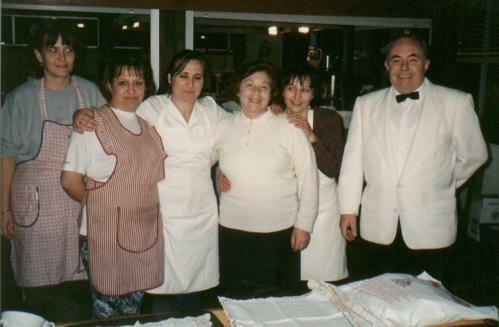 President Alves, who was the district President of the Coimbra district, worked with Brother and Sister Saraiva in the catering business. 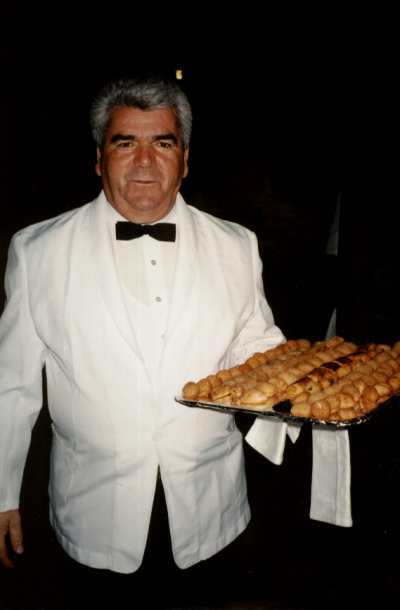 Here he is making the wedding guests welcome with a tray full of appetizers. Click here for a recipe for Bolinhos de Bacalhau. Franciso and Aurora Saraiva prepared an elegant feast for the wedding dinner. On the back table was a whole pig and a leg of ham. On the other table were jumbo shrimp dangling from the layers of the silver serving platter. 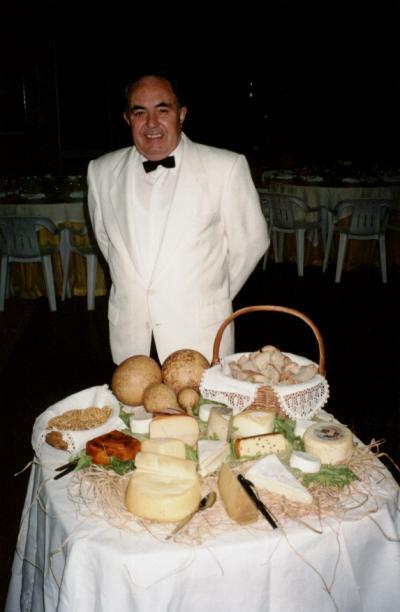 Francisco Saraiva by a table of breads and cheeses. These cheeses were usually eaten with the breads. Oh, the breads and cheeses are wonderful. 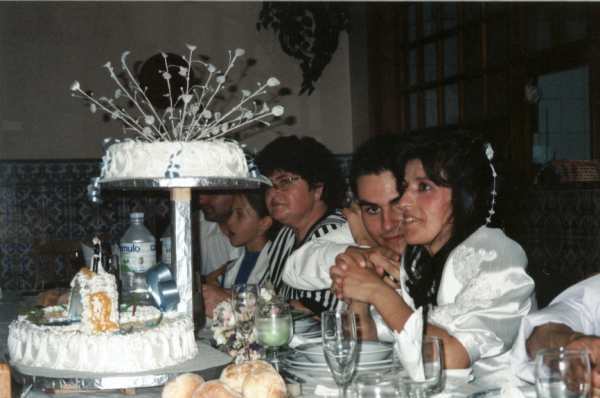 This is a picture of another Portuguese wedding. This is the wedding of Fatima who helped Sister West keep up the mission home. This wedding celebration was held in a local restaurant. The meal lasted for several hours. Many courses of traditional food were served.